15 LCD keys poised to launch up to 210 actions eliminate the need to map and memorize keyboard shortcuts. One-touch, tactile operation lets you switch scenes, launch media, adjust audio and more, while visual feedback confirms your every command. Traditionally this level of control was exclusive to mainstream entertainment broadcasters. Now, it’s at your fingertips. 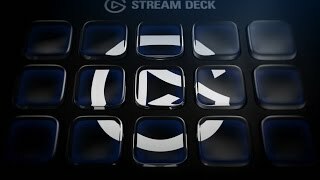 Elgato Game Capture, OBS, Twitch, Twitter, TipeeeStream and more – Stream Deck integrates your tools and automatically detects your scenes, media, and audio sources, enabling you to control them with a quick tap of a key. Customizing Stream deck is effortless. Simply drag and drop actions onto keys, and you’re good to go. Likewise, drag and hold one key over another to create a folder. Better yet, assign your keys custom icons to make them completely your own.